Coffee Talks and Cat Walks: All good things must come to an end. After three years of beekeeping, I had to say goodbye to my bees. I didn't know this could happen, but I developed an allergy to bee venom after being stung in June. During my visit to the ER I was informed that I am now allergic to bee stings and should stop beekeeping because future stings will likely be worse. I was shocked, sad, and determined to go against the Doctors orders and continue my hobby (with EpiPen in hand). Family and friends thought I was crazy and deep down even I questioned what the heck I was thinking. Back when I was in beekeeping school the teacher said "Know this, if you're a beekeeper, you are going to get stung." Ever since my incident, those words have replayed in my head over and over. I know it's true because I have been stung many times before and it's not something I can really prevent from happening again. 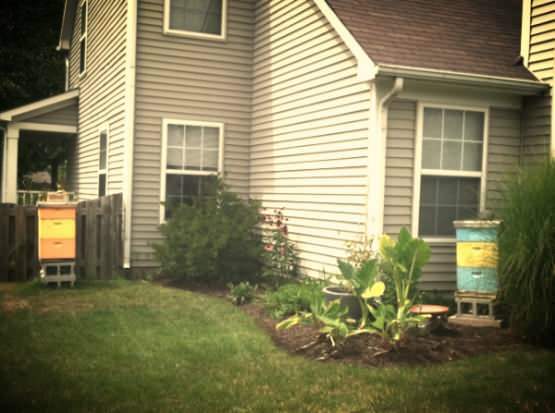 I have battled the idea of getting rid of my bees for a couple months and Sunday I finally did. It was a hard decision, but I know it was the right decision. I found a new home for them and they will be in good hands. While beekeeping is by no means glamorous, I found it to be fascinating and rewarding. Boyz II Men said it best, "It's so hard to say goodbye". I miss my bees and I will miss my hobby. :((((((( This makes me SO sad. I just want to cry!!! Oh Sweetie, I'm so sorry. I had no idea you'd had a reaction. You didn't even mention it when we saw you guys in July. I'm sure it had to be such a hard decision, I'll be thinking of you.